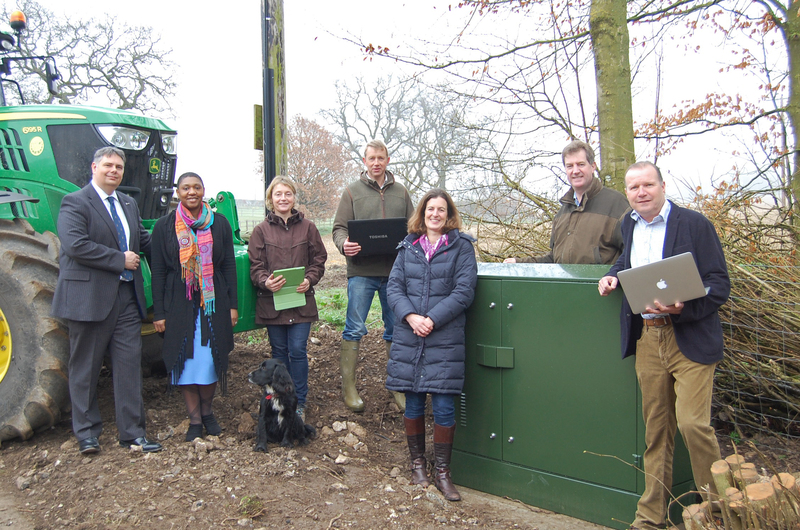 Faster internet connections are enabling one Hampshire farmer to better manage his business, his crops and the environment. For many, the idea of rural farming doesn’t conjure up an image of high-tech operations reliant on the internet, satellites and electronic sensors. But behind the scenes, many farm managers are embracing the digital world to make their operations as efficient and environmentally friendly as possible. Superfast broadband is a vital element in making this happen. There has been a £28million investment from the public sector into superfast broadband across the county. As such, more than 92% of premises in Hampshire now have access, and that’s on track to become 97.4% by the end of 2019 – exceeding government targets. However, providing superfast broadband to the remaining 2.6% of homes and businesses is a challenge, especially in the more remote or rural areas as they are more expensive to reach. Lower Preshaw, near Upham, is one such case, being one of the smallest and most remote communities in Hampshire. The residents there struggled with slow broadband speeds and were desperate to find a solution. Arable farmer, Mark Dunford, in particular, relied on good internet connections to run his business effectively and utilize 21st century farming technology. The residents at Lower Preshaw applied for funding from the government’s Better Broadband Subsidy Scheme which is designed to help people with broadband speeds slower than 2Mbps (megabits per second). They also joined forces as a community to raise the rest of the money to get superfast broadband installed. The project was supported by BT and Hampshire County Council, via the Hampshire Superfast Broadband team, who provided expert advice to find the best way to get faster broadband to such a ‘hard-to-reach’ location. There is now a new cabinet in the centre of the community, providing superfast, fibre broadband to the area. Superfast broadband has enabled Mark Dunford to complete tasks that would usually take hours, within minutes. He is now able to analyse satellite images of crops – which have to be downloaded to his computer – to see where to best place nutrients, much faster than before. He uploads the files to a computer in his tractor which then ensures the machinery applies precisely the right quantity of fertiliser exactly where it is needed, producing healthier crops and reducing waste . He also uses a computer system in his tractor cabin that gives him information on everything from his exact position in a field to machine performance. This data is used to accurately adjust the rate of seed-planting or spacing. Mark isn’t the only one to benefit from the new superfast broadband services. Graham Croft has teenage children who can now enjoy online gaming, and (their parent’s would argue, more importantly), access the internet for school work. Register at www.hants.gov.uk/broadband to find out if you have access to superfast broadband already or to find out about alternative solutions such as Community Match Funding – a scheme that has been designed with more rural or remote communities in mind.